The science instruments for the joint ESA – Roscosmos missions to Mars, launching in 2016 and 2018, are confirmed. Technological developments and instrument payload studies are progressing. The delivery of instrument elements for the Orbiter began, while the first qualification model of a key technology for the ExoMars rover mission was tested. Release of funds to industry until the end of this year supports the work of ExoMars. A major decision was made in July on the scientific instruments that will be integrated in the ExoMars rover to be sent to Mars in 2018. The studies of the rover architecture concluded to the optimal science payload option that would comply with the available volume, with a view to maximise the rover’s science return. A laboratory inside the rover’s body will house three instruments that will examine the Martian soil samples collected by the rover’s drill. Mars Organic Molecule Analyser (MOMA), the largest instrument, will search for molecules that could indicate the existence, past or present, of living organisms. For the definitive identification and characterisation of these molecules, Raman Laser Spectrometer, will provide context information. The samples’ analysis will be complemented by MicrOmega, which is designed to identify, at grain scale, the mineralogical and molecular composition of the Martian samples. These instruments will be supported by four additional European instruments, attached to the external surface of the rover. The Mars Multispectral Imager for Subsurface Studies (Ma_MISS) will contribute to the study of the Martian mineralogy and rock formation, while the Panoramic Camera (PanCam), Close-Up Imager (CLUPI), and Water Ice and Subsurface Deposit Observation on Mars (WISDOM) will search for scientifically compelling places to drill on Mars. ESA and Roscosmos agreed to complement the rover’s external payload with two new Russian instruments. The Infrared Spectrometer for ExoMars (ISEM) will work together with PanCam to select suitable rock samples for further analysis by the analytical instruments and Adron, a neutron spectrometer, will search for hydrogen and hydrogen-bearing compounds and detect solar eruptions. 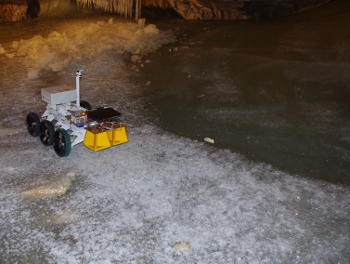 The WISDOM instrument prototype carried on a rover model during tests in the Austrian Alps. WISDOM will provide a detailed view of the upper layers of the Martian subsurface when incorporated into the ESA’s ExoMars rover. ESA and Roscosmos have also confirmed a set of four instruments that will be carried by the Orbiter, to arrive at Mars in 2016. ESA will provide two instruments, Nadir and Occultation for MArs Discovery (NOMAD) and Colour and Stereo Surface Imaging System (CaSSIS). NOMAD, already part of a previous payload configuration, is a spectrometer suite aiming to detect the components of the Martian atmosphere, even in low concentrations, and map their locations. CaSSIS is a high resolution camera capable of obtaining colour and stereo images over a wide swath. The two instruments provided by Roscosmos are an Atmospheric Chemistry Suite (ACS) that will investigate the structure of the Martian atmosphere and help scientists understand the Martian climate, and a Fine Resolution Epithermal Neutron Detector (FREND) that will map the hydrogen on the Martian surface, targeting deposits of near-surface water ice. Several meetings between ESA and Roscosmos, including European industrial partners and key Russian institutes and research centres, have been held to scope the broad international cooperation and advance the technical understanding. A release of funds to industry until the end of the year supports the work on ExoMars. The manufacturing of the primary structure of the Orbiter's flight model is well advanced, with the central tube composite structure being completed. The avionics procurement is also progressing and nearly all of the electronic equipment have been ordered, while the most critical units’ design is near completion. In parallel, the delivery of instrument elements for the Orbiter began with the supply of the NOMAD instrument software model. The overall design of the Entry, descent and landing Demonstrator Module (EDM) has been reverted to the configuration without the Russian contributions (instruments on the Martian surface, nuclear heaters and small electric generators). The propellant tanks and the landing platform structure, including the crushable structure are currently under review in order to start manufacturing the flight models. The heat shield structural model components are being built for tests in the next quarter. A structural model of the DREAMS science payload has been delivered for integration into the structural model of the lander’s surface platform. Roscosmos has presented a first baseline design for the descent module. This module, weighing approximately 1.6 tons, will carry the Rover and the surface science platform. The first qualification model of a key technology for the ExoMars rover mission was tested during the latest drill’s functional verification in laboratory conditions by Selex Galileo. This test will contribute to the qualification of the drill system in 2013. ESA and Roscosmos plan to start the design phase (Phase B) with all the parties involved for the 2018 mission within the third quarter.